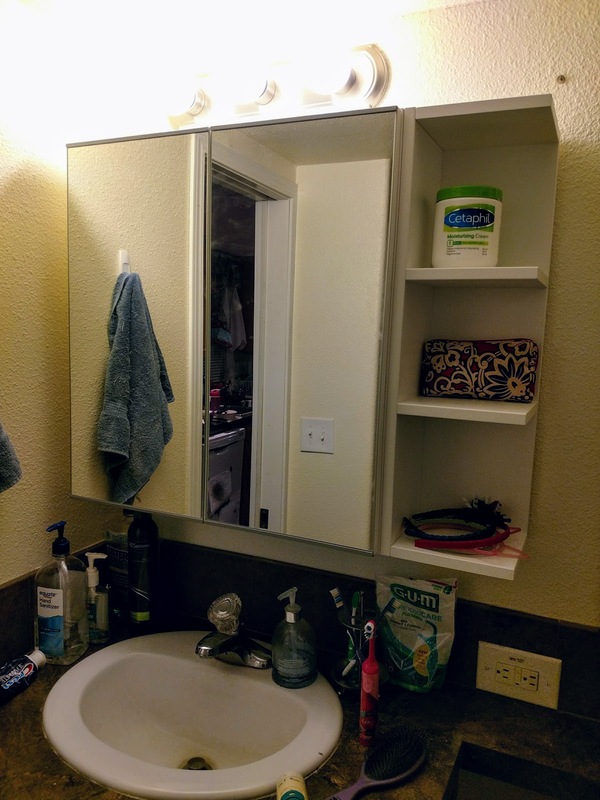 My dad came over on Thursday and kindly installed my brand new mirrored cabinet in our bathroom. He assembled the cabinet at his house and carried it up here to hang. It's a pretty heavy cabinet even before we filled it with stuff, and the screw holes didn't match up with the studs in our bathroom at all. 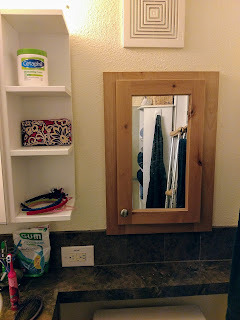 We had some birch boards left from making Sweetheart's toddler bed last year, and we decided to screw two boards perpendicular to the studs on the bathroom wall and then attach the cupboard to those boards. The back of the cabinet is slightly recessed, so it barely sticks away from the wall even with the two boards there. When I was pregnant with Sunshine, Chris accidentally rubbed a good-sized chunk of paint off the wall in the bathroom while cleaning, and we ended up doing a quick, unplanned paint job in there in order to protect the walls from moisture. (This just goes to show how low quality the paint is that came with our house: it literally comes off when you rub it.) My mom and Chris did the painting, and they just painted around the mirror and skipped behind the toilet at the time. 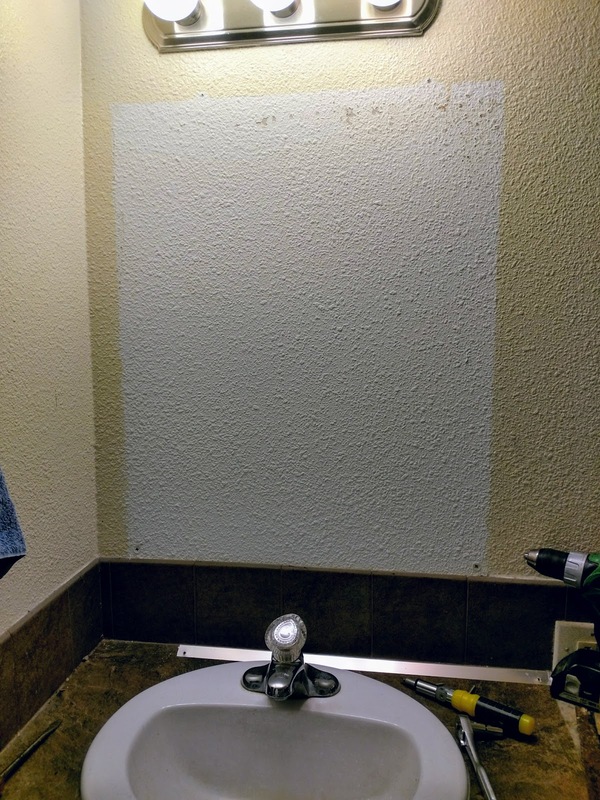 We cracked our original toilet tank a few years ago, so I was able to finish painting that wall when we replaced the toilet, but the wall behind the mirror was still white. The paint was something my parents had leftover from their own painting project, and my mom isn't sure if they still have any left or where it might be now. The new cabinet covered up all except the few inches of white right above the counter backsplash. I'm not sure if we will just leave it as is long term or if we well try to match the paint somehow, but you can barely even tell that it's white and not yellow down there. My dad is a very handy guy with a lot of experience building things, and he always does a great job leveling everything he hangs, but when I came to check on his progress, I immediately felt like I had walked into a crooked house. It didn't match the rest of the bathroom at all! (I wish I had thought to take a picture.) I couldn't imagine that my dad had hung it so crooked, so I used his level to check, and I was right. The cabinet was perfectly level. Our bathroom counter and wall, however, were not level at all. Our house has apparently settled a bit since we planted it here nine years ago. I don't know if that's a big deal or not, but we all had a good laugh at how ridiculous the cabinet looked. My dad was able to adjust it to match the house, but now I'm wondering if we need to adjust our house?! It still has its axles and wheels attached, but it's set up on concrete blocks with wood wedges to level it. Either the ground has moved (entirely likely) or the wedges have slipped a bit, but it definitely tilts toward the door side of the house these days. Once the cabinet was screwed onto the wall (at the same angle as the house) and the doors and shelves were attached, I loaded it up with all the stuff that had previously been cluttering up our bathroom counter. Almost every single item fit. It's like a whole new room. Chris said it looks so much nicer than it did before, and I agree completely. I see a lot of tiny houses with open shelving, and I know I could never make that work. I love the lighter, more open feel of skipping the upper cabinets, but it's so much harder to keep everything clean and looking neat when it's all in full view all the time. 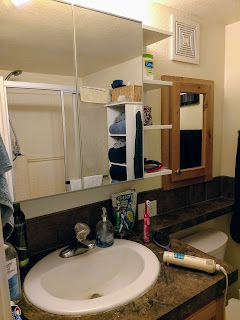 I used to be embarrassed to have anyone see our cluttered bathroom, no matter how well I arranged it, but almost every thing we had on the counter was either stuff we use on a daily basis or things that we like to keep on hand, like extra hand soap and sunscreen. And it was always covered with a layer of dust and lint and hairspray. With our new cabinet, we can keep everything up and out of sight, and it will be so much easier to keep the bathroom clean and company-ready if I don't have to move and wipe down all the little items every time I clean. My only regret is that we didn't put a cabinet in there years ago.